The Harry S. Truman Chapter Color Guard is shown here during the presentation of the First Harry S. Truman Chapter coin. 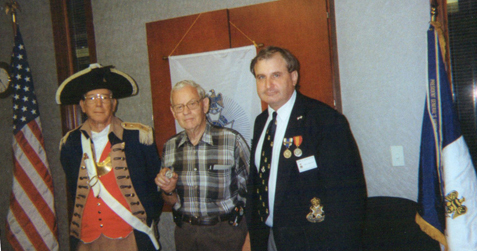 The Harry S. Truman Chapter coin is being presented to David McCann by President Dirk Stapleton and MOSSAR Color Guard Commander Robert L. Grover. Photo: (L - R) Major General Robert L. Grover, MOSSAR Color Guard Commander, Compatriot David McCann, and President Dirk Stapleton.